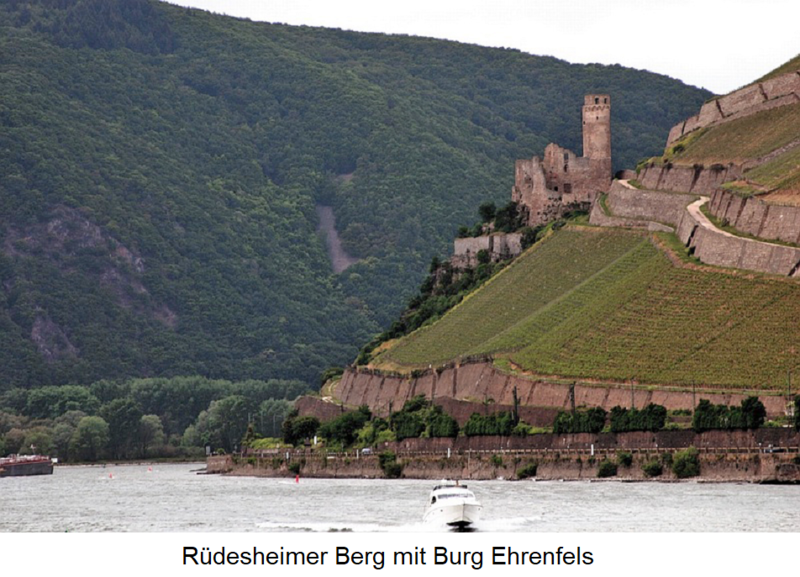 Survey in the district of Rudesheim in the German wine-growing region Rheingau, The mountain is exactly where the Rhine its river direction turns from west to northwest. According to a legendary tale, Emperor is said to be here Charlemagne (742-814) during a cruise on the Rhine to his Palatinate in Ingelheim ( Rheinhessen ) have observed that on the slopes of the Rüdesheimer Berg the snow melted first. He then ordered one here vineyard to put on and out with vines Orleans to plant. The mostly southward and only in the westernmost part to the southwest aligned vineyards cover about 95 hectares of vineyards with a slope Tilt up to 60 °. The soils consist of Taunus quartzite and slate with varying proportions, which are mixed in shallower areas with loess and loam. It is extremely mild climate with optimal agitation before. The sunlight ( exposition ) and heat are the highest in the Rheingau. Over 90% will be here Riesling cultured. Until the 1970s, the vineyards consisted of countless small, separated by dry stone walls plots, In the Land consolidation 1971 they were in the individual layers Mount Kaisersteinfels. Mount Roseneck. Mountain Rottland and Mountain Schlossberg divided. This page was last modified at 3 March 2019 at 14:08.